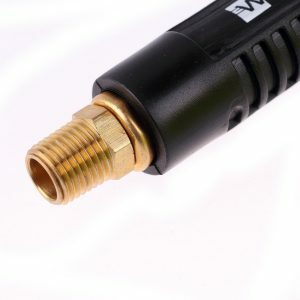 Most good air compressors do not include an air hose. 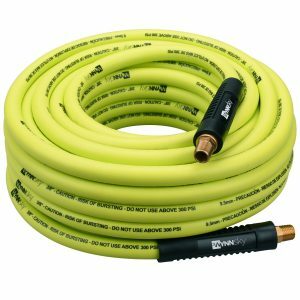 Some of the lower end models include a low-quality coiled air hose (typically cheap PVC). 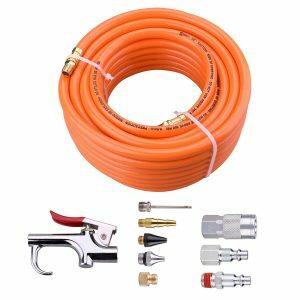 Instead of being frustrated from buying the cheapest air compressor hose online, just get one of the a high-quality Air hoses from Wynnsky Professional tools. Engineered to meet the highest standards, our premium pneumatic air hoses are great for homes, workshops or professional applications. 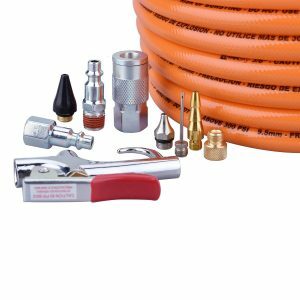 Whether it’s in a commercial auto mechanic shop or in your home garage, our pneumatic air hoses are perfect for supplying pressurized air to tires, pneumatic tools and more. Our heavy duty hoses are well built to resist checking, cracking and fading. Due to their reinforced construction, they offer extreme all-weather flexibility, no kink under pressure, zero memory, and are lightweight. They allow for up to 300 PSI, and have been tested to function in -40 to 190 degree F of temperatures.